There are two 2.5" plastic rings with a squiggle (plastic lacing similar to curly laces which the birds love to chew), connected by nickel plated "O" rings hanging from nickel plated welded chain with a sleeve for ore chewing fun. 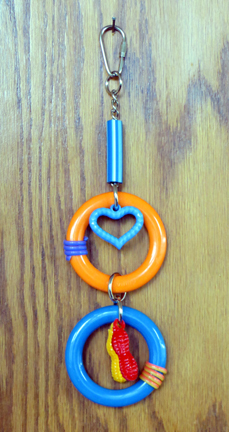 There is a dangling open heart in the top ring and a couple peanut pendants in the bottom for added beak pleasing fun. There is an eye ring on top with a nickel plated pear link for easy hanging and lots of motion and texture in this fun toy. Lovenuts was built for the mid sized beaks in your house and is a long lasting toy. These are individually handmade in the USA, colors, styles and beads may differ from photograph.